Vista Verde is a hostel with local owners, with Mayan descent. It all started with a dream, the story begins with a mother with six children, fighting hard to give each day her bread to each of her children. The owner named Celia is 60 years old, previously engaged in the work of laundry, agriculture and more. Our first language is the Mayan Qékchi language, the second language is Spanish, therefore we speak very little English. If you want to have a contact with the local Mayan culture we recommend you to come to green view, all our staff can tell you our roots and traditions, our language and customs. We have an incredible pool, overlooking the small town of Lanquin, a sunrise that you can never forget. Vista Verde Hostal is the first ecological hostel with descendant lanquinera, located at the entrance of Lanquin. For your comfort, the hostel offers a bar and restaurant service onsite. Breakfast is served daily, extra-fee may be applied. From the property, you will enjoy fantastic views over the mountain, river or city. 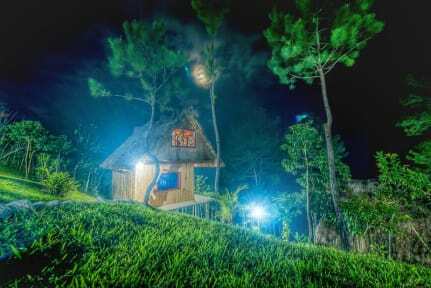 Vista Verde Hostal is located near Lanquin, at the top of a small hill overlooking the city and mountain. 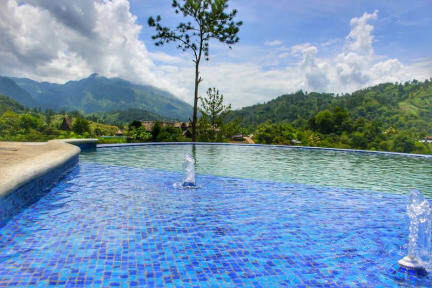 The property is located only 5 minutes away from the city of Lanquin. Vista Verde Hostal offers comfortable rooms, private and shared rooms. There are dorms up to 5 people and private rooms for 2 people. All rooms have shared bathroom. Breakfast not included. Extra-cost: 30 Quetzal / approx. 4 euros per person per day. No 24-hour reception. Opening time is from 6 am to 11 pm.